As the Lesotho Mounted Police Service (LMPS) celebrates 146 years of policing, the Prime Minister promoted 253 Police Recruits to Police Constables during a pass out parade held at Police Training College (PTC) in Maseru on Thursday. 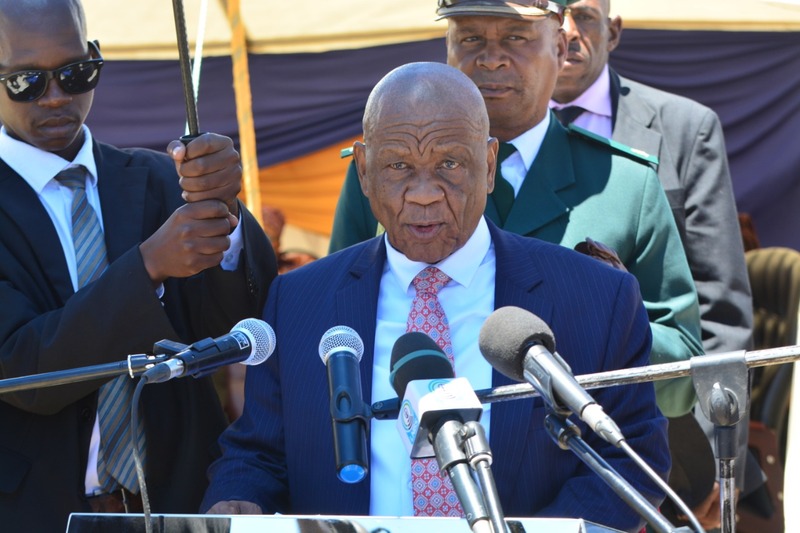 Speaking at this event, Dr Motsoahae Thomas Thabane reminded the police that they are entrusted to maintain peace and stability as well as to prevent crime in the country. He said stability leads to the country’s economic development as investors will be attracted to invest into Lesotho. He said the government is concerned about the escalating rate of crime in the country, saying these include police brutality and police who work collaboratively with culprits, saying this tarnishes the good name of His Majesty’s police officers. Furthermore, he urged them to bear in mind the Police slogan, which says, ‘Police, A helper and A friend’ and to respect the rights of all people, including crime suspects until they are proven guilty by courts of law. Dr Thabane therefore wished them success and strength in the job they have been called for, urging them to respect themselves so that they can be respected by other people. Speaking at the same event, the Minister of Police, Mrs. Mampho Mokhele appealed to the public to always ensure that their vehicles are roadworthy thereby urging them to stop promoting corruption by bribing the police. She strongly urged them not to participate actively in politics so that they can fulfill the mandate of LMPS effectively, saying it is high time that politics, which prevail within LMPS come to an end. Sharing the same sentiments, the Commissioner of Police, Holomo Molibeli strongly condemned the behavior of accepting bribe, saying whoever does will be dismissed. He reminded new Police Constables that they have sworn to serve Basotho selflessly and with respect, urging them to fulfil the mandate of LMPS, which is to provide safety and security to all as well as to prevent crime in partnership with the community and other stakeholders. He therefore encouraged them to implement what they have learned during the training for the betterment of Basotho, urging them to avoid activities that are against the rules and regulations of LMPS, which include corruption among others. The training commenced on February 11 and the new Police Constables were equipped with skills like drill walk, self defence, physical training, patriotism and discipline. As part of the ceremony, the Prime Minister presented awards to those who performed well in drill walk, discipline, academic performance, fitness, leadership, horse rider, enthusiasm, marksman and physical training. The event was graced by the presence of the Deputy Prime Minister, Lesotho First Lady, Malawian First Lady, Cabinet Ministers, senior government officials and the public.